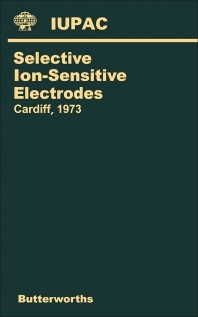 International Symposium on Selective Ion-Sensitive Electrodes contains the plenary lectures presented at the International Symposium on Selective Ion-Sensitive Electrodes, held in Cardiff, UK on April 9-12, 1973 and organized by the International Union of Pure and Applied Chemistry. The papers explore significant developments concerning selective ion-sensitive electrodes and cover topics ranging from potentiometric gas sensing electrodes to precipitate-based selective ion-sensitive electrodes and mechanistic aspects of ion-selective membrane electrodes. This book is comprised of five chapters and begins by introducing the reader to ion activity scales for use with selective ion-sensitive electrodes. Ion activities in dilute solutions, concentrated solutions, and mixtures of electrolytes are described. Attention then turns to the use of carrier antibiotics and model compounds as components of selective ion-sensitive electrodes. The next chapter focuses on a number of precipitate-based electrodes based for example on mixtures of metal chalcogenides, as well as enzyme electrodes and coated wire electrodes. Their analytical application in the widest sense is reviewed for anions and cations. This book also considers techniques used in elucidating glass, liquid, and crystal membrane electrode operation, along with their possible mechanisms. The final chapter analyzes a number of potentiometric gas sensing electrodes using hydrogen or other ion sensing electrode and a gas permeable membrane. This book will be of interest to students and practitioners of chemistry, biochemistry, and electrochemistry.